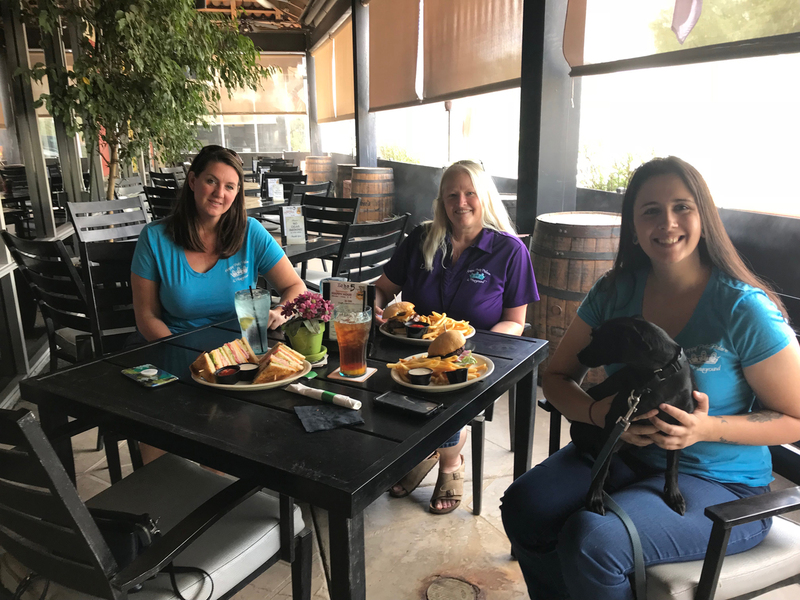 We will be blogging on different dog-friendly restaurants in the Mesa, Gilbert, and Chandler area over the next few months, until we have tried all that we think would be a good fit. We post our schedule on our website under Calendar of Events if you want to see where we’ve been and where we’re going next. The dog-friendly patio at Echo5 Sports Pub offers a perfect set-up for dogs. 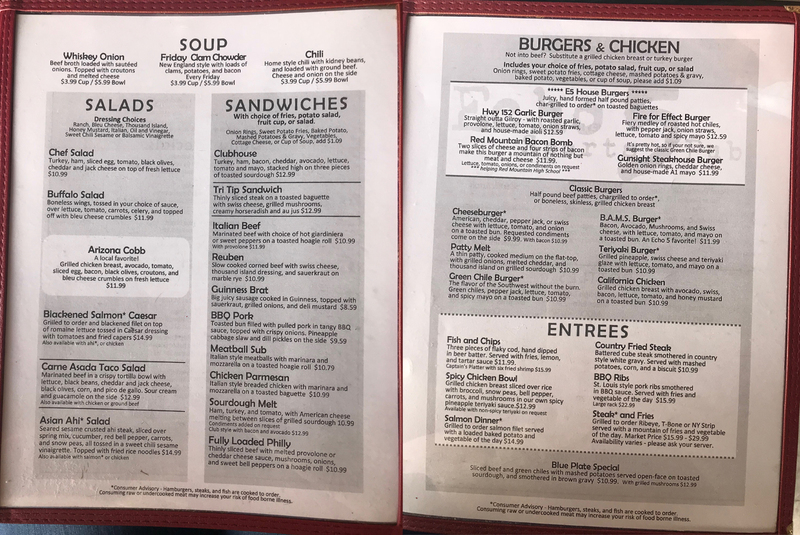 The restaurant is located in northeast Mesa, close to Las Sendas, Red Mountain Ranch, Mountain Bridge and other beautiful upscale residential communities. The restaurant is a sports bar and has 20 or so televisions on the inside, but the patio is T.V. free making it easier to connect with people without distractions. The restaurant has done a nice job creating a comfortable and spacious dining environment both inside and outside. The patio feels secluded and private even though the restaurant is on busy intersection at Power Road and McDowell. The patio is covered with a strong sturdy roof which adds to the secured feeling making you feel completely protected. You may need some exposure to Feng Shui to appreciate how a room environment can create feelings of safety. Echo5 Sports Pub has done a nice job to create a very pleasant atmosphere. We love that the patio has misters to keep cool. It also has pull-down shades to block sun when needed, large potted plants for outside feel and added privacy, and plenty of space near your table and under your table for your dog to hang out while you enjoy your meal. 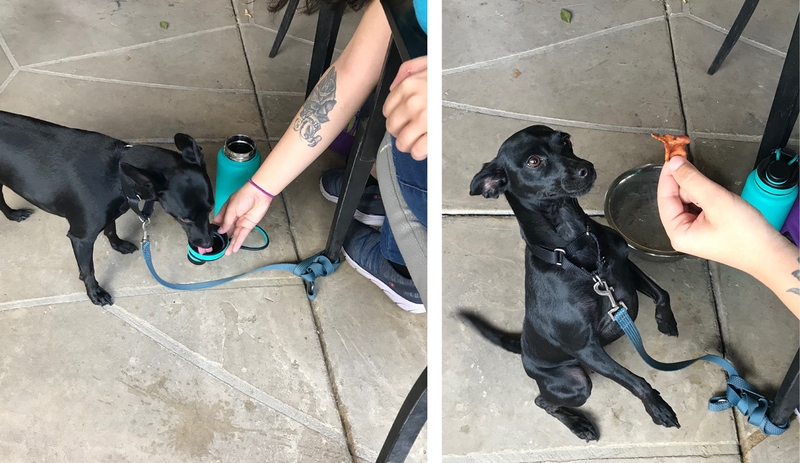 Zoey, a Chihuahua-mix rescue, enjoyed her first pet-dining experience on the dog-friendly patio with us. Mia brought the bare essentials for her 3-year old baby girl. She packed a thermos with cold drinking water with a dog-friendly drinking lid and one poop bag. Zoey was adopted a couple years ago from http://www.angelsforpaws.org/ by Mia, the Supervisor at the Happy Pets Palace in Mesa. Zoey has been well socialized with both humans and dogs. She enjoys her friends at doggy daycare and takes daily leash walks where she meets several people and other dogs. And because she has manners from being trained properly at home, she was a natural at eating out with us. It seemed as though she had been to a few dog-friendly restaurants before, but that was not the case. She’s just a happy-go-lucky dog who enjoys being around people. It can be easier taking smaller dogs to restaurants than larger dogs because they fit easier under tables and their tails are smaller to tuck out of the way so they don’t get stepped on. Zoey weighs about 15-pounds. Before we received menus, our server brought Zoey a large dog bowl of ice water and two strips of delicious bacon. Oh yeah, we were impressed with the generosity and caring to make Mia’s dog, Zoey, feel extra special. Zoey enjoyed doing some tricks to earn her bacon strip treats. She gobbled up each treat with high marks of approval! We arrived before the lunch crowd. Mia ordered the cheeseburger, I ordered the teriyaki burger which is topped with pineapple, and Rebecca had the clubhouse sandwich. Come hungry! You can see the lunch portions are very generous. No room for desert after this meal. If you are a light eater, then split a meal with your friend or plan to take half of it home with you. 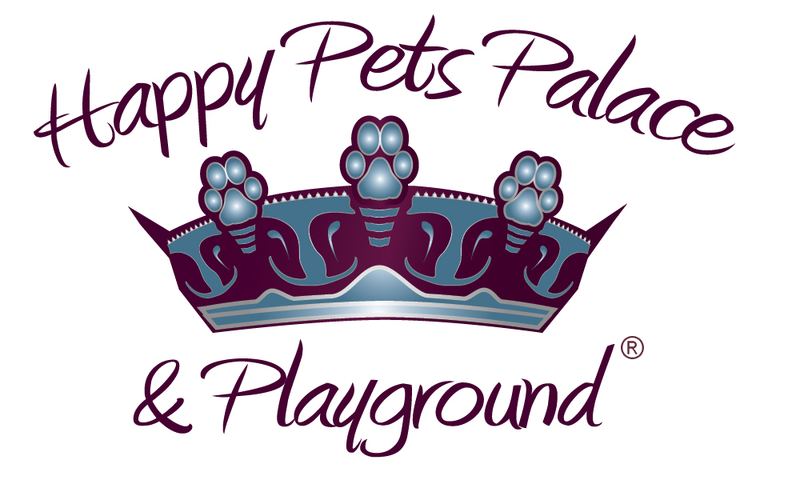 You could also order a meal suitable for your dog too and share with your pet. The dog-friendly patio entrance is near the front door of the restaurant. If you have your non-service dog with you then seat yourself to a table on the patio because you can’t go inside the restaurant. But be sure to catch attention of a server so they know you are there. Being a full-service restaurant, a server will meet you at the patio to offer you a menu and take your order. The server is also your cashier. When you bring your dog with you to eat at Echo5, know that you do not need to leave your dog alone to step inside the restaurant. 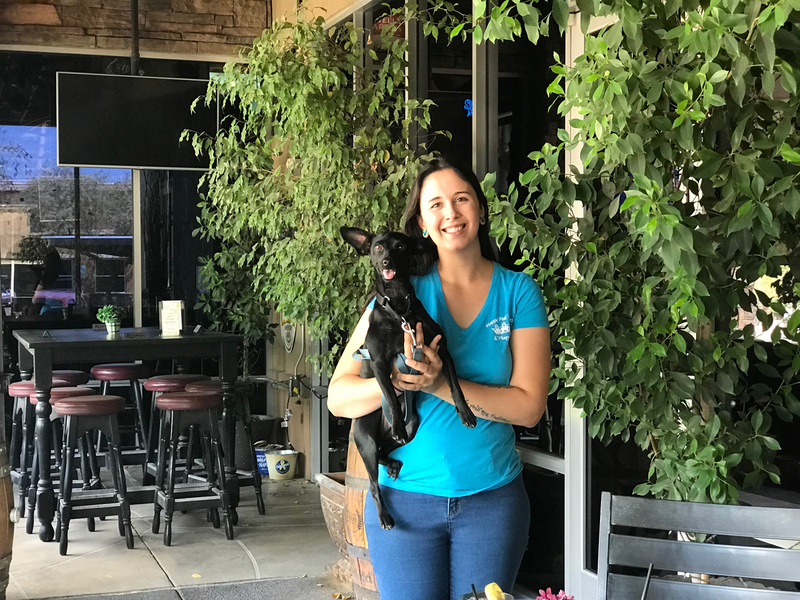 You can enjoy everything from the dog-friendly patio whether you’re eating lunch or dinner, or just stopping in for a cold one. As with all our pet-dining experiences we comment on the bathrooms because you might need to use one. There are indoor bathrooms at Echo5 Sport Pub. Plan in advance if you normally use the bathroom at restaurants because you will not be able to take your non-service dog inside with you at Echo5. Check out our future upcoming restaurant blogging dates on our Calendar of Events.